On 2 December, 2013, Premier Li Keqiang and Prime Minister David Cameron held a joint press conference in the Great Hall of the People. Li Keqiang briefed the audience on the outcomes of the annual meeting between the two heads of government. He said this important meeting is held against the backdrop of the upcoming 10th anniversary of the China-UK comprehensive strategic partnership. Both sides agreed that China and Britain should maintain the sustained, sound and steady development of the bilateral relations on the basis of mutual respect and treating each other as equals. The British side reaffirmed its respect for China's sovereignty and territorial integrity, adherence to the one China policy and respect for China's core interests and major concerns. The Chinese side expressed appreciation for this. Li Keqiang pointed out that China and Britain are both major world economies and important forces in the international community. As strategic match and common interests expand, China-UK relations will not only have a bearing on the welfare of the two peoples but also a global impact. Under the new situation, China-UK relations are taking on greater global and strategic significance and are mutually beneficial to both sides. China is ready to work with Britain to forge partnerships for common economic growth, political mutual respect and trust and mutual cultural learning and progress. China and Britain should work together to step up trade and investment liberalization, oppose trade protectionism and further enrich China-UK comprehensive strategic partnership. Premier Li also expressed the hope that China-UK cooperation will increase speed like a high-speed train and bring more benefits to the two peoples and contribute to world peace and development. 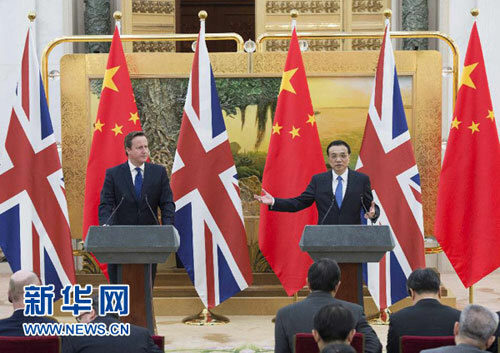 David Cameron talked about the global and strategic significance of UK-China relations. He said that China's rise is an opportunity not just for China, but for Britain and for the world. The two countries should show mutual understanding, respect and support, open market to each other, oppose trade protectionism, expand mutually beneficial cooperation in various areas, strengthen cultural exchanges and broaden relations in international and regional issues. Britain is ready to work with China to shift relationship up a gear and achieve more outcomes and progress in UK-China and Europe-China relations.